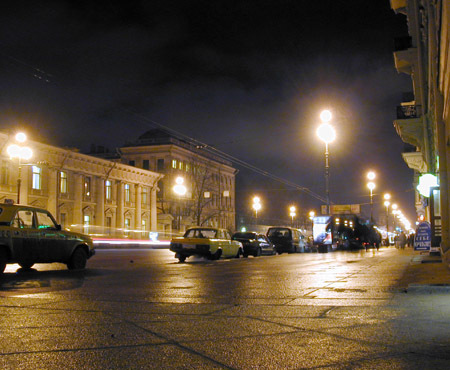 It appears that we still haven't walked Nevsky Prospekt at night. 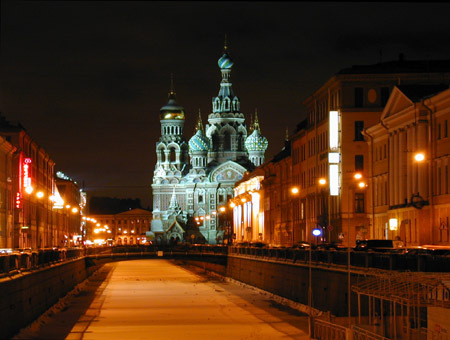 But this is also a continuation of the album on the Anichkov Bridge and its surroundings. That's why we walk from the Bridge and in the direction of Palace Square. So here you are, Nevsky. To the left, the trading rows of the Anichkov Palace and a part of the actual Palace (a bit further on and up). To the right one sees the stone plates with which Nevsky (and other central streets) recently was paved. Discussions are still raging on the question of whether this is good or bad (we used to have asphalt). But one might as well get angry at the weather. Here, I just liked the shadow. 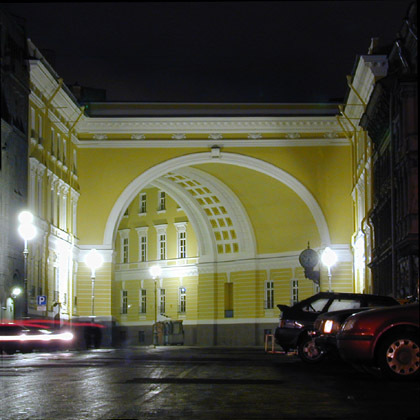 Gostiny Dvor or Yard (central part). In general, very few buildings appear in this album. The majority is either too large for photographs, or covered in scaffolding, or badly/not at all lit. The Catholic Church of St. Catherine, which was also included in the album on non-Orthodox churches. 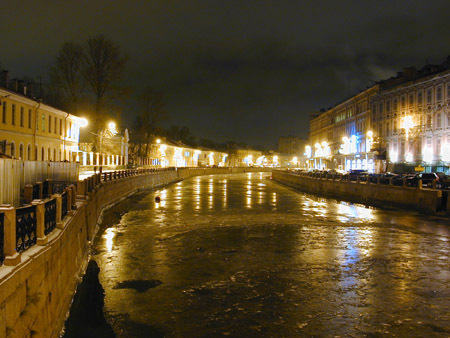 Spas-na-Krovi (the Saviour on the Blood) by the Griboedov Canal. From the look of it, they have changed the colour of the lighting, and it's gentler. The Cathedral now looks good and turns out well in photographs. 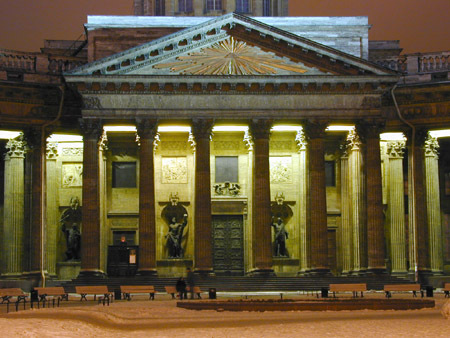 The Kazan Cathedral. 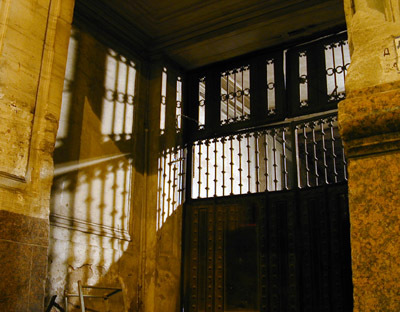 This photo is composed of three separate ones; therefore, the colonnade looks uneven. 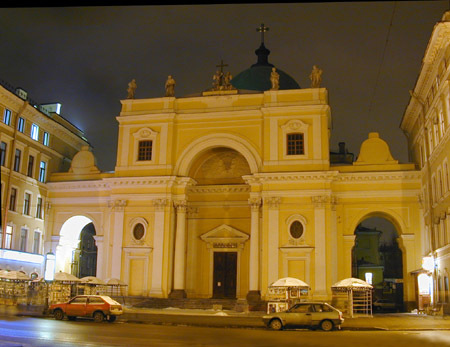 The Cathedral was built in 1801-1811, and the architect was A.N. 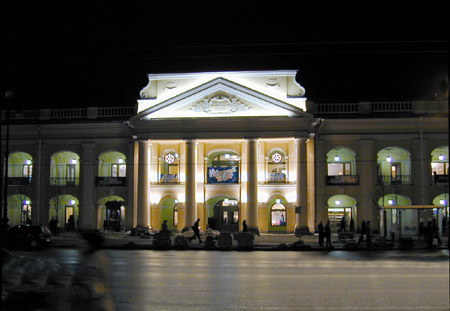 Voronikhin. Following the emperor Paul I's wishes, the Cathedral bears a marked resemblance to St. Peter's in Rome. In 1813, the Field Marshal M.I. Kutuzov was buried here, inside the Cathedral, with French trophy banners, and apparently also city and fortress keys, at his side. From 1932 to 1992 this was a museum of religion and atheism. "A dark force appeared, destroying temples and monasteries, annihilating people of faith, stealing them from God with false promises, creating false gods, negating love and morality, introducing new foreign rituals, replacing the life in God with a life in permissiveness and sin." One feels that an attack of "permissiveness and sin" as by magic coincided also with the return of the church from 1986-1993. The "false gods" are evidently the worship of science and the education of the whole population as opposed to a select few. Their discontent is understandable - it's a bit more difficult to get the educated to go to church. 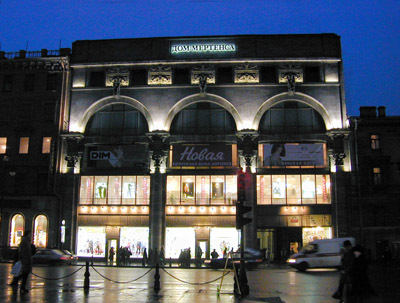 This is the Mertens Trading House (that is the name it was built under by the architect M.S. Lyalevich in 1911-1912). The Great Konyushennaya Street ends here. This looks completely different at day. Moika from the Politsiya (People's, Petrov, Green) Bridge. 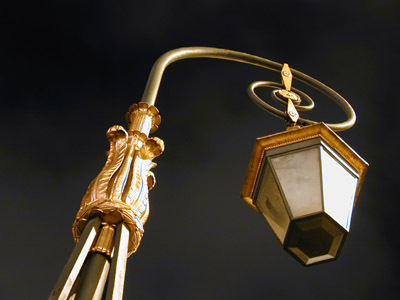 One of the lamps on the Bridge. The lamps were put up in 1904-1908. Later, they were lost, but came back on the Bridge again in 1951. The Arch of the General Staff. No, we will hardly stop on Palace Square, but go further to the Strelka.